The Taj Mahal, Delhi’s forts and North Indian Hill Stations such as Manali are among the many unmissable places on any India bucket list. True, they are famous… but are they really unmissable? When it comes to dealing with huge crowds, congested festival seasons, and overpriced accommodation, I and Kit often prefer to skip these places altogether. Why? Because there are always some other unexplored places in India that make for fantastic alternatives to any India backpacking route. The size and breadth of the Subcontinent encompass so many different environments, from the Himalayan mountains to the crystal clear waters of the Andaman sea, that it’s foolish to think that we know it all. India, like it or not, is a continuous discovery, even after we have collectively spent almost two years trawling many of the wonders, but especially the most unknown places in India — that’s what this site is all about. For example, did you consider visiting Northeast India? If so, please read our tips to backpack Northeast India. 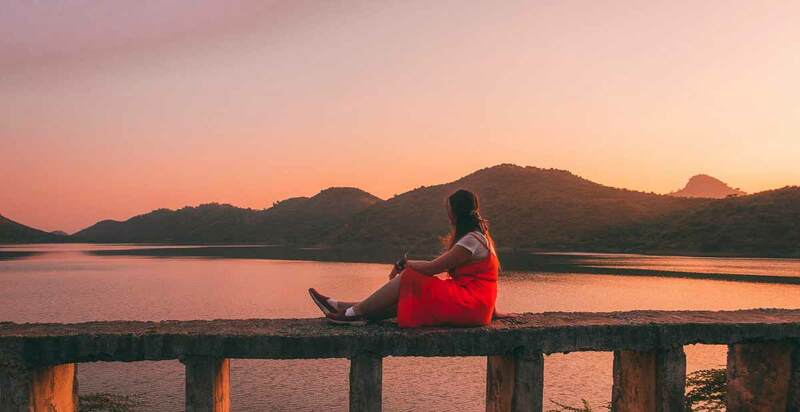 That’s exactly because India is so rich and diverse that we can’t do it all: for once, we have asked other travel bloggers to chime in and share with us what are some of their favorite secret places in India, so that you can get inspired for your next trip. Without further ado, let’s have a look at some unique places in India you may have never heard of before. 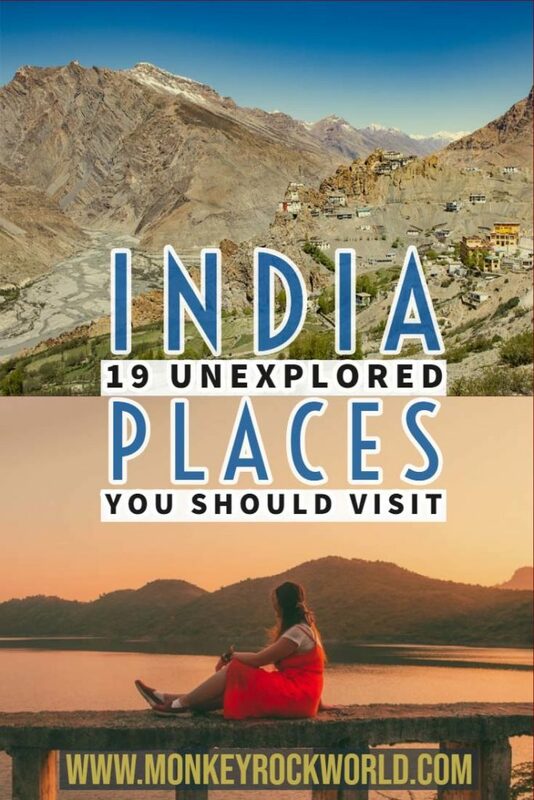 Because it’s only when you start getting off the beaten track, diving into the nook and crannies of India, that you leave the big cities and their congestion, and find some of the real Wonders of India. ADD THIS ARTICLE TO YOUR PINTEREST BOARDS! Alsisar, an offbeat Rajhastani town, is still an unexplored place that stays off most itineraries. WHERE: Alsisar, Rajasthan, is hardly ever mentioned among the best cities to visit in India. This small town by Indian standards (no more than 7000 souls live there) used to be a desert outpost along the Silk Route, and its heritage is visible in the many havelis, buildings that were used by merchants to run their businesses as well as relax and meet other traders. WHY VISITING: Alsisar retains the charm of the nicest cities in Rajasthan, but very little of the chaos and pollution. It’s a pleasant place to visit for a couple of days, to just wander the small streets and visit the many havelis. There are plenty of photo opportunities, with friendly locals always willing to pose for photos, and several good places to admire a great sunset. HOW TO GET THERE: The best starting point to reach Alsisar is Jaipur, one of the biggest cities in Rajasthan - it’s located at around 200 km which can be covered in little over 3 hours by car and around 4 hours time by bus. There are two daily buses connecting Jaipur to Alsisar, for around 300 Indian Rupees. Volvo buses can be booked online, and you can even select your favorite pick up point. 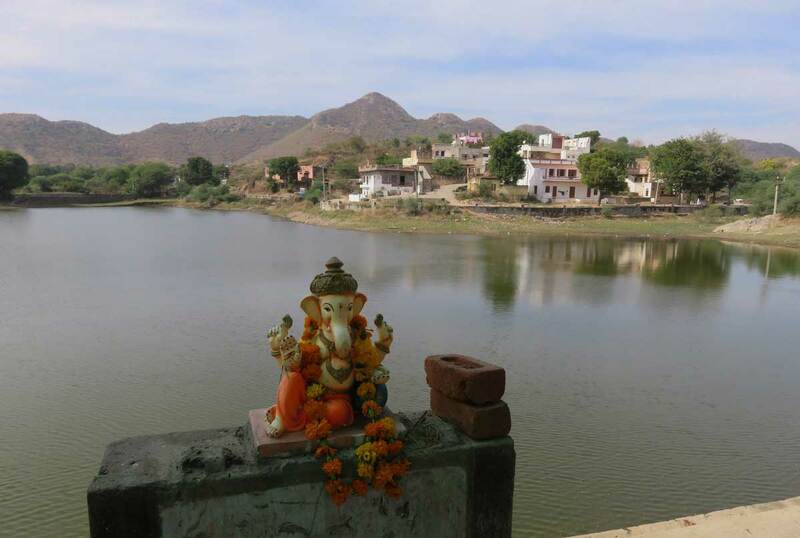 Delwara is an unexplored town near Udaipur that very few tourists visit. 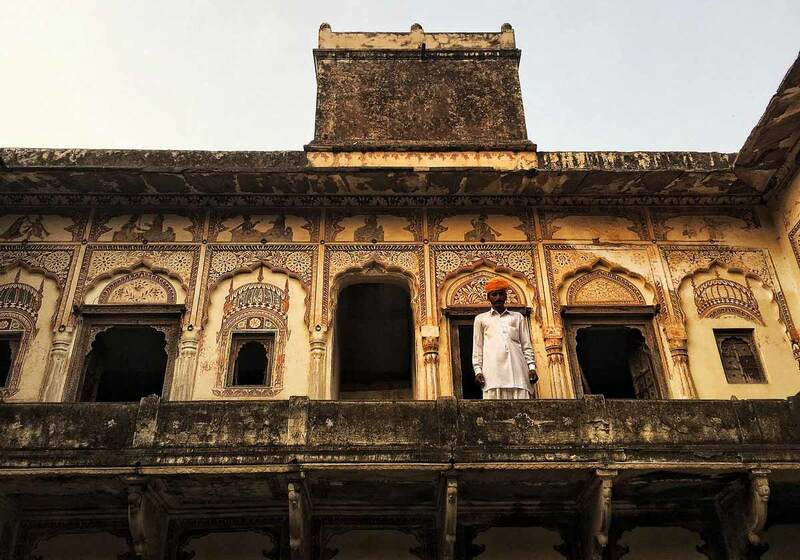 WHERE: Delwara is a small village in Rajasthan that few people know about, despite its interesting heritage as an important town in the Mewar kingdom. It is also called the town of the gods, because of its ancient Jain temples. It’s a beauty and with the help of an NGO Delwara started a community-based organization. WHY VISITING: One of the projects is the Delwara heritage walk to attract tourists to town. Delwara remains off the beaten path though and it offers an authentic glimpse of village life in Rajasthan. The streets with its colourful buildings and temples are scenic enough, but the heritage walk will teach you more about what you see. The people of Delwara are rightly proud of its heritage and handicraft traditions and are happy to show you around. HOW TO GET THERE: If you want to visit a unique destination in Rajasthan that is not that touristic, Delwara is a must. It is an easy short day trip from Udaipur with frequent buses that take less than an hour to get there. Your visit will be worthwhile whether you take the Delwara heritage walk or explore on your own. 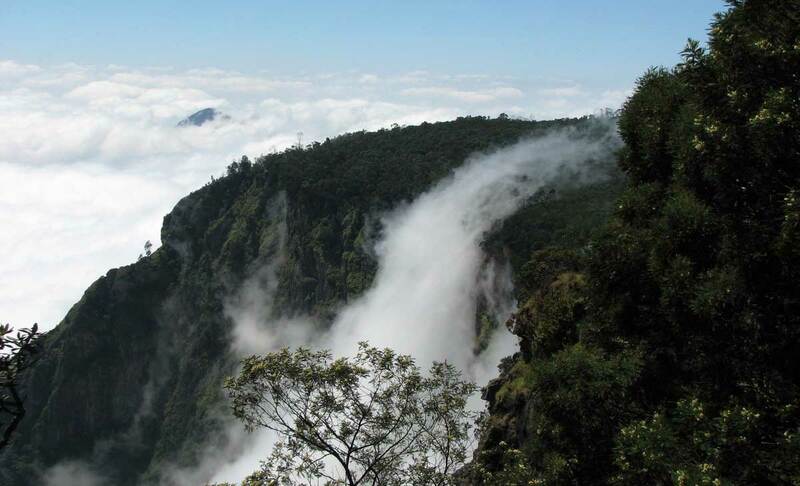 Clouds floating next to a mountain in Kodaikanal, one of Tamil Nadu's unexplored hill stations. WHERE: Kodaikanal is a charming hill station in Tamil Nadu state of southern India. WHY VISITING: Fondly called as the ‘Princess of Hill stations’ by locals, Kodaikanal literally means ‘gift in summer season’. Kodaikanal is possibly the coolest place in Tamil Nadu: even in the middle of infamous Indian summers, you can feel the chill in this hilly town. It has so many things to do if you are ever bored by just relaxing in the mountain air. As a bonus, not many tourists know about this charming town, so it is not crowded like Ooty! Coaker’s walk is a short walkway that looks into a beautiful valley. You can feel as if you are floating in the clouds as they are just a few feet over your head when you walk here. This tourist spot is also the center of the town. If you choose a hotel around this spot, you can easily walk to the other attractions in this town without wasting time on transport. Bryant’s park, Kodaikanal lake (has boating in it and shopping around it), Dolphin’s nose, Pillar rocks, Silent Valley and Berijam forest are a few of the other spots you must visit here. HOW TO GET THERE: Madurai, at 120 Kms from Kodaikanal, is the closest city with an international airport. You can take a bus from here to reach Kodaikanal. Many other major cities of South India like Coimbatore, Chennai, Bangalore have buses plying to Kodaikanal regularly. If you prefer to travel by train, ‘Kodai Road’ station is the closest railway station at about 80 Kms to Kodaikanal. You can take a taxi from there to reach the hill station. The stupas at Mahabalipuram, one of Tamil Nadu's famous, yet pretty unexplored places. WHERE: I grew up in Chennai and spent a good part of my years here, going to school, hanging out with friends and cousins. One of my favorite things to do while visiting Chennai is a trip to Mahabalipuram, one of the best places in South India. 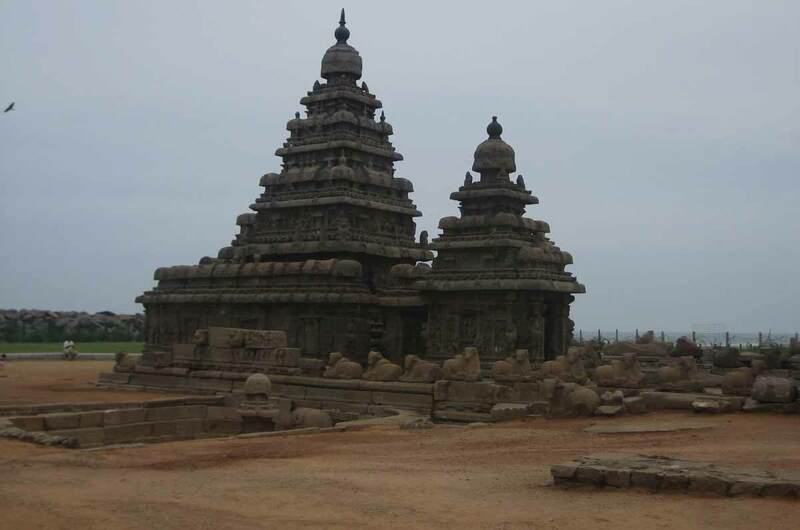 WHY VISITING: Visiting the UNESCO Heritage site of Mahabalipuram makes for an excellent day trip. It is known for its Temples and Chariots (Rathas) carved out of rocks and cave sanctuaries (mandapams) built in the 7th century. Don’t miss the huge open-air reliefs such as the famous Descent of the Ganges, Arjuna Penance, and the Shore temple which was part of a huge complex now submerged under water. There are sixteen man-made caves in different stages of completion, scattered through the area. The striking feature is that all the sculptures here are monolithic – giant structures carved from single rocks. It's pretty hot in summer, so make sure and bring along some water. HOW TO GET THERE: Its better to leave after Chennai city rush hour which is around 9:30 and try to get there before the noon or plan to be there around 3 or 4 pm. It is only about 55 km from Chennai You can buy small sculptures and statues made of granite stones at the artistry workshops nearby. If you have time you can plan to spend the weekend in a resort nearby. 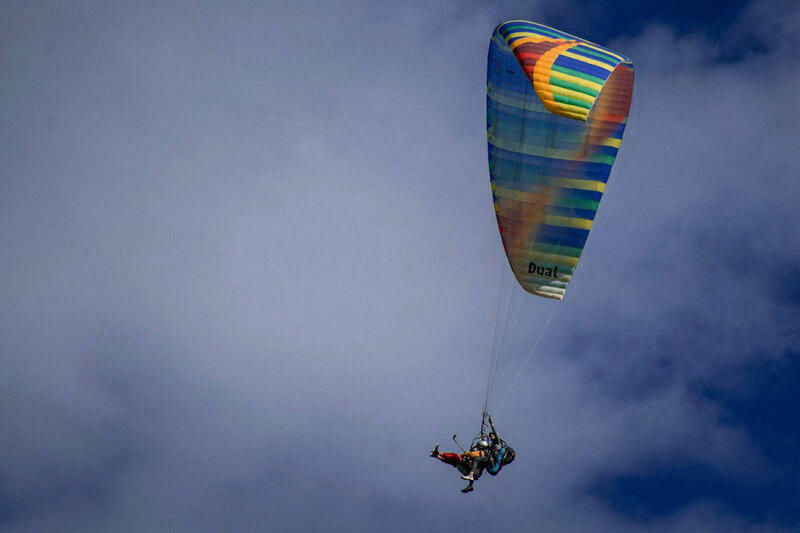 Paragliding over Bir and Billing in beautiful Himachal Pradesh. WHERE: Bir and Billing are two of the most beautiful and relatively unexplored villages in Himachal Pradesh. WHY VISITING: While the nearby cities like Dharamshala, Mcleodganj, Palampur, etc. get a lot of attention from the tourists, Bir Billing is still a haven for peace and quiet lovers. Known for the Tibetan colony that resides here, Bir Billing is also home to several monasteries where you can spend time to gain some clarity in your life. That’s not all though, Bir Billing is also Asia’s Best Paragliding Site so, if you are looking for an adventure then this is the place to be. There are also many 1-day and multiple-day treks from here, offering mesmerising valley views. It’s really one of best places to visit in India during summer to escape the crowds. HOW TO GET THERE: There are many ways for you to reach Bir from Delhi but the quickest and the most convenient way is by taking a Volvo Bus. The bus takes about 12 hours and drops you at the Chougan market area. Another popular way to reach Bir is by taking a train to Pathankot Railway Station. From here, you can take a local bus or hire a taxi to reach Bir. A view of Kolukkumalai, an unexplored tea growing area of India. WHERE: Kolukkumalai is a small hamlet at the border of Kerala and Tamil Nadu. At an altitude of almost 8000 feet, it is the highest organic tea estate in the world. WHY VISITING: “Untouched natural beauty”, is an adjective still applicable for the Kolukkumalai tea estate located in the most densely populated country of the world. The bumpy jeep ride through the unforgettable greenery is a trip to remember. There are permanent camps in the tea estates for those who would like to stay in the lap of nature. So, if the sight of unending tea gardens, occasional waterfalls, cute wooden bridges and colorful mountain blossoms attract you, then you should visit Kolukkumalai. A bonus will be a tour of the highest tea factory in the world, where you can learn about the orthodox method of tea processing and sip a cup of orange pekoe tea. HOW TO GET THERE: The nearest city with good airport connectivity is Kochi in Kerala. 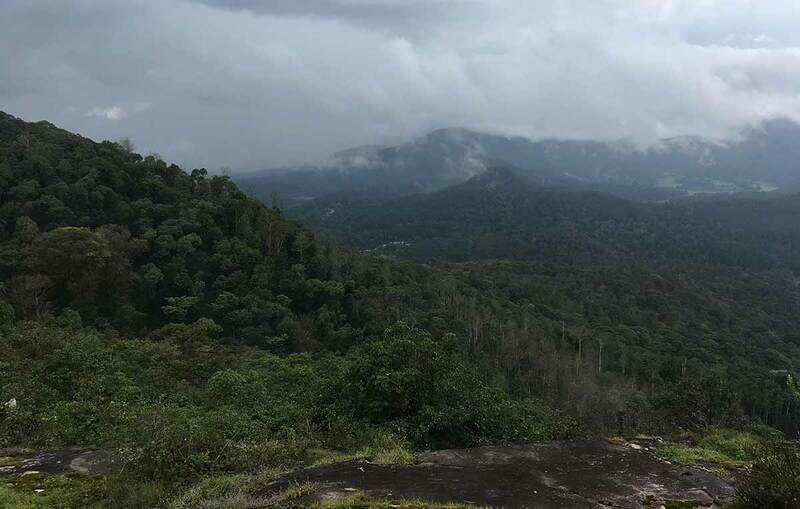 From here you can start a 150 km long road trip to the Idukki district. 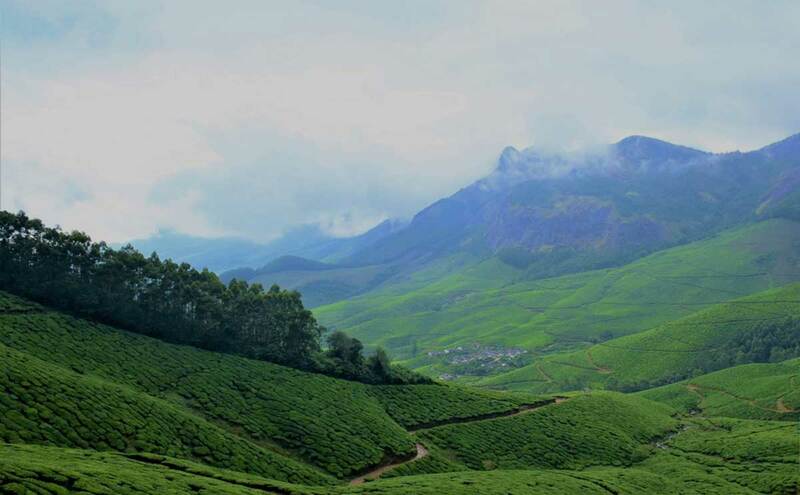 From Idukki, you must either hire the official jeep service or trek for over 10km to Kolukkumalai tea estate. A stunning view from Chopta mountain, definitely an unexplored place in India. WHERE: Chopta is a region located in Uttarakhand, a stunning state in Northern India that encompasses parts of the Himalayas. It is famous for Tungnath, one of the highest Shiva temples in the world. 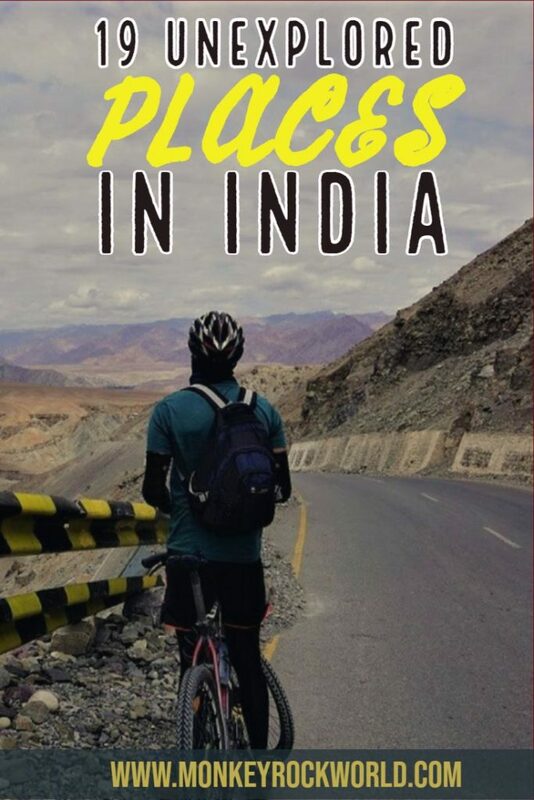 WHY VISITING: My friend and me biked deep into the Himalayas during a week-long getaway. After stopping at a village leading to the Chandrashila Peak, we took on a breathtaking 4-hour trek towards the mountain top. 4,000 meters above sea-level, the hike offered a panoramic view of ample greenery and vast mountain ranges. The silence of the Himalayas is only broken by an occasional chirp of a bird or two. There were barely any people in sight. Below us, the cliffs into a distance beyond the eye’s view. The whole experience was absolutely magnificent. HOW TO GET THERE: The nearest train station to the Chopta Chandrashila Trek is Haridwar. From there, grab a taxi or bus towards Chopta. Afterwards, hike towards the small village that sits on top of the hills. Here, you will find Tungnath resting amongst the mountains. Gorgeous view of Dhankar and its hanging monastery towering above the Spiti River. WHERE: Two years ago, we visited Spiti, a remote Himalayan highland area in India, which is bordering Tibet. The lowest point is located at 3800 meters altitude and the area is mainly dry and rocky. 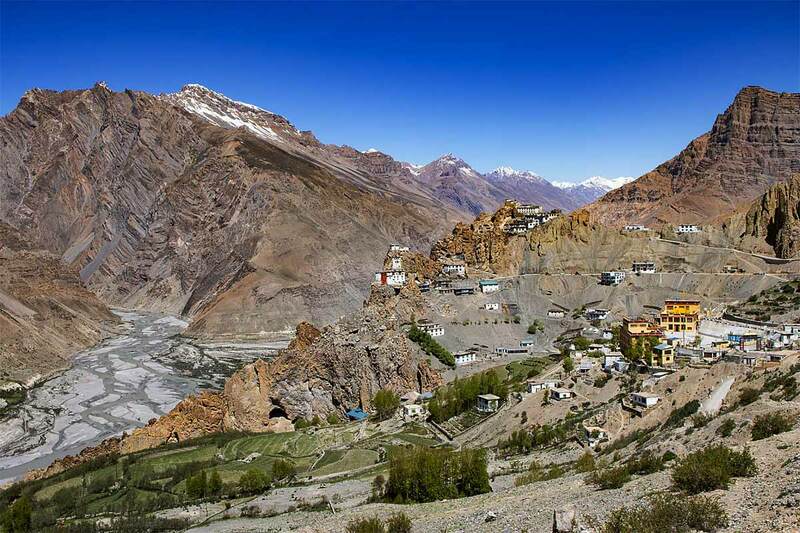 WHY VISITING: The age-old villages are perched over rocks and some of the most prestigious Buddhist monasteries, including Tabo, Key and Dhankar monastery, can be visited in Spiti. Hiking in those heights is not for the faint-hearted but for the real adventurous out there. We did a fossil track in Langza village which I absolutely recommend as well. We made real meaningful friends with locals and travelers from all over the world in Spiti. Everyone is more down to earth because you need to live with the raw basics such as limited water, major electricity cuts, and zero phone network and internet. HOW TO GET THERE: To access Spiti, you can start out at Manali with a professional driver and a 4x4, or catch the daily bus from Kullu to Kaza (you MUST book your ticket a day earlier). There are two ways to access Spiti, the closest is via the Kunzum Pass which is only open after the snow melt in June for a limited period of 3 months per year. The second access road is via Rekong Peo and the Kinnaur valley, which has a strong military presence, and some of the most treacherous roads in the world. 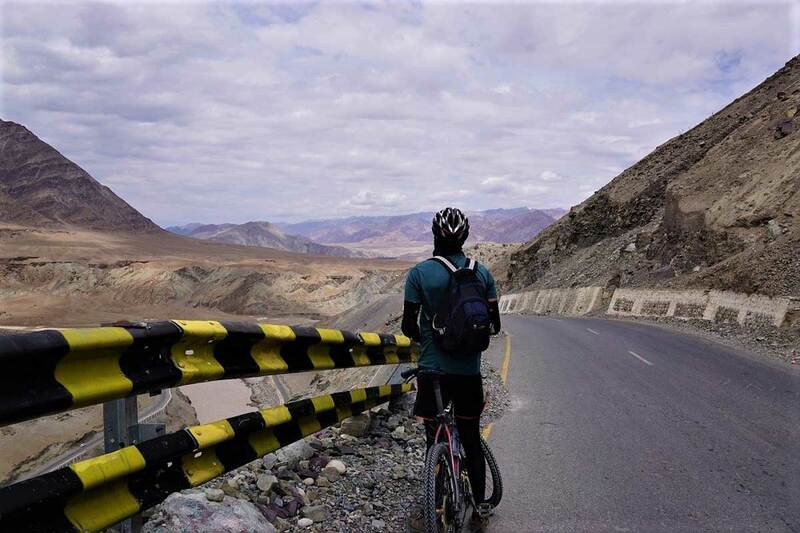 Cycling in Ladakh will get you out of the hipster trail and onto some very unexplored Indian roads. WHERE: Pedalling past Himalayan nomads, army camps, and one of the highest peaks in the world is not just a thrill, but a spiritual experience. The ice-capped peaks, the contentment, the thin clear air and general sense of adrenaline teaches you to slow down and appreciate the many colours of nature. This was what we felt when we cycled through the land of the lamas, in Ladakh, on the Leh to Srinagar highway. WHY VISITING: Ladakh is a region filled with warm Buddhist monks, colourful monasteries, all in complete contrast to its harsh and rugged terrain, which forces even the nomadic people to be constantly on the move for their own survival. Known as the ‘Land of The Highest Passes’, situated at 3,000metres, we cycled this rollercoaster terrain from Leh towards Lamayuru on the Leh to Srinagar highway. When you’re riding out on the road, we saw the Himalayan counterparts of India through a completely different lens. We noticed men on their bullets roaring into the wild carrying all their worldly belongings strapped onto their backseat. Sometimes you see them struggling to navigate the steep bends and sometimes you see them stopping at the side of the cliff staring into nothingness with deep, tired eyes. HOW TO GET THERE: To get to Leh, the easiest option would be to take a direct flight from New Delhi airport. Once you’re in the city you can rent your bikes from the Summer Leh mountain bike shop on the infamous Changspa Road. The rental per day cost us around 700 rupees ($10). 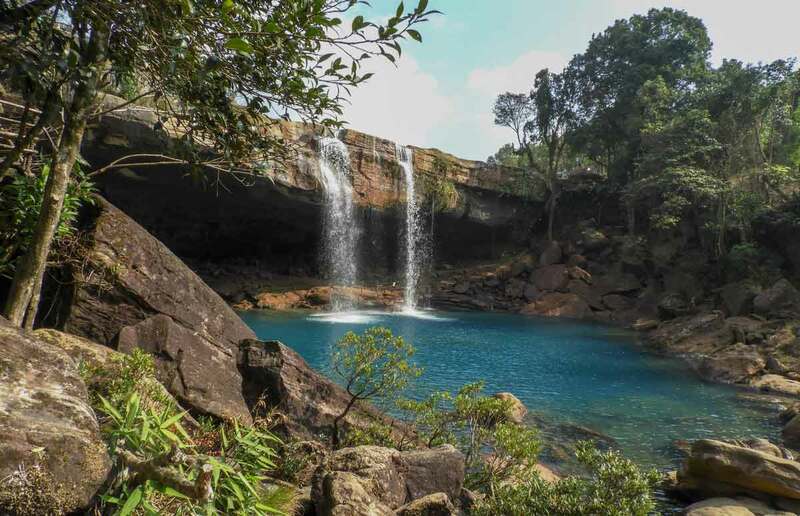 The majestic Krang Suri waterfalls of Meghalaya. WHERE: Most people think of Northeast India and have Darjeeling in mind, but there are so many more incredible places to visit in the Northeast. This little known gem is one of India’s most magical waterfalls, with shimmering blue waters bathed in sunlight. It’s a short ten-minute hike down an easy trail with steps made of local stone. There are viewpoints along this trail that let visitors have a good look and get more excited about this place. WHY VISITING: The gorgeous falls are nestled amidst trees and rocks, and the whole scene resembles a postcard. The cascading falls form a pool which is perfect for a swim – no fear, as changing rooms are available. Explore the cave below the falls to get a view from the other side. You can also visit the lake above the caves and take a boat ride. The best part? Very few people, as of now. Visit this unspoilt beauty before it gets too famous! HOW TO GET THERE: Krang Suri is located in the Jaintia hills district near Jowai. It is 91 km away from Shillong, the capital of Meghalaya. The nearest airport is Umroi,30 km from Shillong. Only Air India flies here directly. The alternative is flying to Guwahati airport and then proceed by road on a shared taxi to Shillong (120 kms/3 hours). From Shillong, you can travel by rented car or motorbike. The roads are in good condition, and the trip to Krang Suri takes about 3 hours. Start early to get the most of this remote destination. 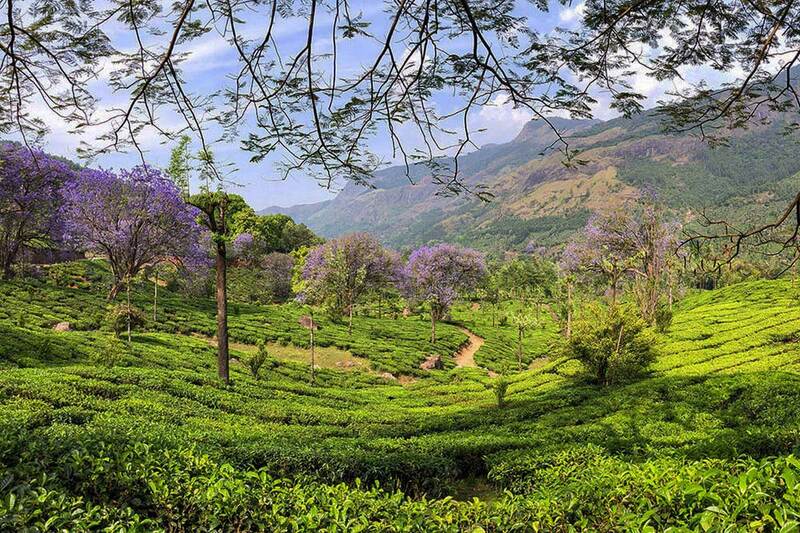 Munnar is a famous tea growing hill station, but coming here to see the Jacaranda trees is a whole other thing. WHERE: Munnar is a hill station in the southern state of Kerala that is famous for its tea plantations and its spectacular mountain landscapes. WHY VISITING: The hillsides have been landscaped by men with vibrant green tea trees for over one hundred years, and it’s now a sight to behold all year round. If you explore Munnar during spring, however, you will also have the bonus of seeing the Jacaranda trees in bloom. The contrast of these beautiful purple flowers set against the vivid green of the tea trees makes the landscape look like a burst of colour on a canvas. HOW TO GET THERE: The best place to see this spectacle of nature is the Vagavurai Estate, along the Munnar-Marayur road. You will need your own transport, but you can hire a car for the day in Munnar city. You can stop by the side of the road to admire this incredible sight and it’s easy to access if you want to take some photos too. An Apatani woman with her traditional face tattoos and nose plugs. This tradition is disappearing fast. WHERE: The quaint and lush Ziro Valley, home of the Apatani tribe, lies within the remote state of Arunachal Pradesh in Northeast India, a charming area of little traditional villages set among abundant rice fields. If you’re interested in discovering a part of India which tourists rarely get to experience, be sure to put the Ziro Valley on your itinerary and let yourself be enchanted! 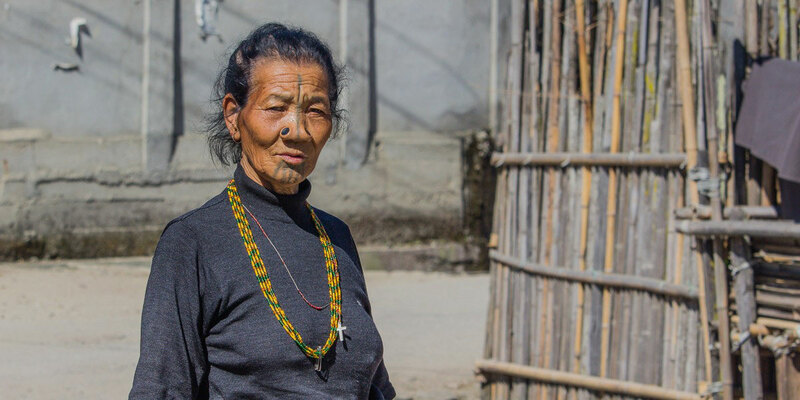 WHY VISITING: The serene region is mainly known for the fact that many of the older Apatani women have tattooed faces and wear nose plugs, but this is not all there is to the Ziro Valley. The traditional villages, locals of which are typically animist (although some have converted to Christian), are as fascinating as they are colorful, whilst the markets in town should be visited with caution by those who are not ready to fully embrace the local culture, due to some questionable food items on sale. Observing an animist ceremony conducted by a shaman in Ziro was probably one of the best experiences we had during our travels in India, although getting to the Ziro Valley is no easy task. HOW TO GET THERE: You can get to Ziro by private or shared taxi (typically a Tata Sumo), which is the main form of transport used in Arunachal Pradesh. If you’re coming from Guwahati, the major town in Northeast India, your best bet might be a combination of train and shared taxi, though the journey might take a couple of days due to the limited transport options. 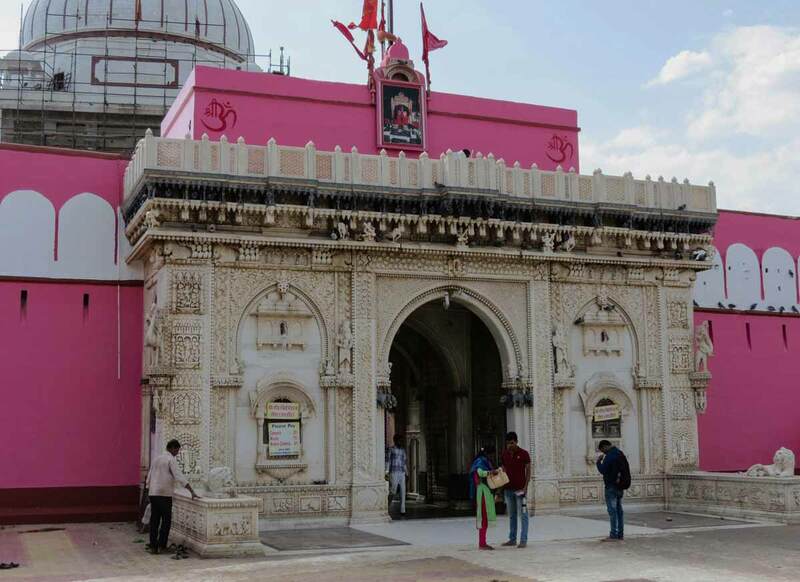 The entrance to the Karni Mata temple in Bikaner. WHERE: India counts many temples, but one that drew our particular attention from the first moment we heard about it was the Karni Mata temple in Bikaner, Rajasthan. This temple houses a large family of several thousand rats: devotees from all over India travel great distances to worship these animals. WHY VISITING: Rats in a temple sound a bit strange, right? I think you understand how this detail really triggered our attention, so much so we had to add this stop to our Rajasthan itinerary. If many devotees have to travel for several days to pay their respects to these small furry animals, we decided that the short trip from Bikaner was the least we could do to discover what made the place so special. HOW TO GET THERE: The temple is about a 45-minute drive from Bikaner. All taxi drivers know the temple or, alternatively, you can take one of the frequent buses leaving from Bikaner’s main bus terminal. WHERE: Champaner Pavagadh was added to the UNESCO World Heritage list of Indian sites in 2004 as an outstanding blend of Hindu-Muslim architecture, and one of the most forgotten historical places in India. WHY VISITING: These sites date back to a regional capital city that was built in the 16th century and represent cultures that have now disappeared. It does, however, remain a place of worship and continuous pilgrimage for Hindu believers, but it’s otherwise rarely visited by others. The architecture is simply quite stunning. You’ll be able to buy – and we recommend – the Indian Archaeological Society’s guide book on the site to know about what you’re seeing. HOW TO GET THERE: The closest city to Champaner Pavagadh is Vadodara, which is well worth a visit in its own right. You can either take a local bus to the site from the market place or take a taxi. We took the taxi, as the various temples are spread over quite an area, although it is also possible to negotiate an auto rickshaw when you arrive at the site. 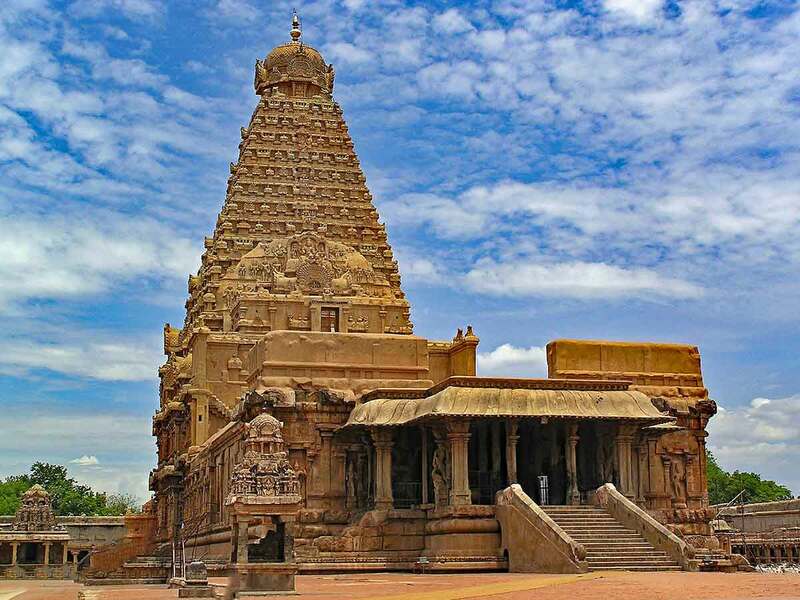 WHY VISITING: Thanjavur is a place of major historical importance in India. It was once the capital of the powerful Chola empire and is now known as the cultural capital of Tamil Nadu. The most impressive of the town’s ancient sites is the Brahadeeswarar Temple, which dates from 1010 AD. This UNESCO World Heritage Site is one of the largest Hindu temples in all of India. It’s dedicated to Lord Shiva, so you’ll see lots of lingams (phallic symbols) carved out of stone in the pillared cloister. This symbol is closely associated with Shiva and is sometimes even called a Shiva linga. To this day, Brahadeeswarar Temple is an active place of Hindu worship, and foreign visitors are welcome. There’s a small garden in the back of the temple that offers respite from the noisy city. And just a five minute walk away, the Hotel Karthik offers budget rooms and serves authentic vegetarian southern Indian food. HOW TO GET THERE: The nearest major city is Tiruchirappalli, often called Trichy for short. Trains from the Tiruchirappalli Junction station to the Thanjavur Junction station take between 45 minutes and 1 hour. The sunrise at Puri's main beach, still one unexplored place in India. WHERE: The Jagannath Temple is the name Puri is usually associated with, and while it is a major draw for tourists, there’s so much to do in and around Puri. WHY VISITING: The architecture of the 12th-century temple awed me with moments where literally my mouth was left wide open. However, the entry to the main shrine in the temple is allowed only for Hindus. The sea drives the crowds from the temple to the beach at dawn & dusk alike. Catching the sun rise up the horizon on the east coast is an experience I’ll never forget. It was worth waking at 5 AM in the morning. A few hours from Puri is a lake home to Irrawaddy dolphins in Asia’s largest brackish lagoon. The authorities organize a 2-hour boating tour taking through various islands, showing crabs, pearls and finally the dolphins. Even in the winter months, the mercury soars here, so I’d recommend carrying a water bottle and a hat. Konark’s Sun Temple is a UNESCO acclaimed archaeological site with intricate architecture to admire and no idols are there to worship. The temple is also one of the Seven Wonders of India. 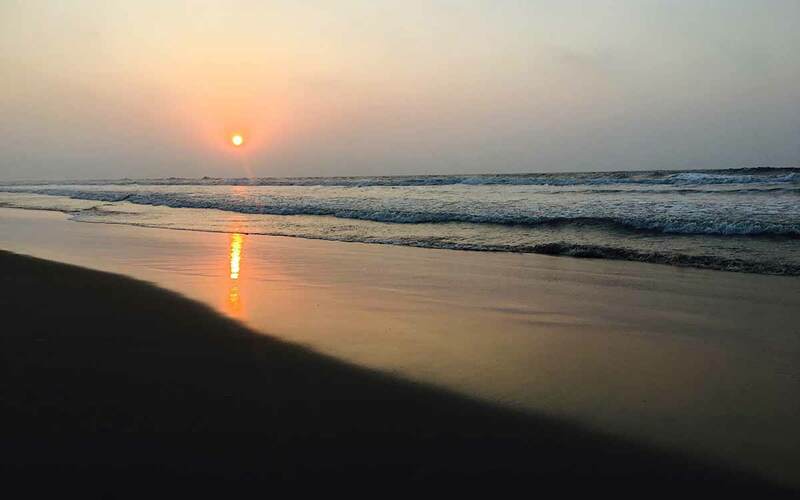 The town’s Chandrabhaga beach is the cleaner and quieter alternative to Puri’s touristy beach. The marine drive falling parallelly to the state highway from Puri to Konark makes for an amazing journey. Odisha’s capital Bhubaneshwar has as many as 700 temples, each and every one intricately carved. The temples revolve mostly around God Shiva and the most famous is the Lingraja temple. The outskirts of the city have numerous historic places to see including 2nd-century caves, a Shanti Stupa with King Asoka’s rock edicts. HOW TO GET THERE: Odisha is well connected through roads, rails & flights and the capital Bhubaneshwar also has an international airport. To reach Puri, cabs are available from the airport and the trip takes no more than 1.5 hours. A view of majestic Gulmarg, still quite an unexplored place in Indian Kashmir. WHERE: If you’re visiting North India, you shouldn’t miss exploring Gulmarg, a naturally beautiful town with the backdrop of the Pir Panjal mountains in Jammu and Kashmir. 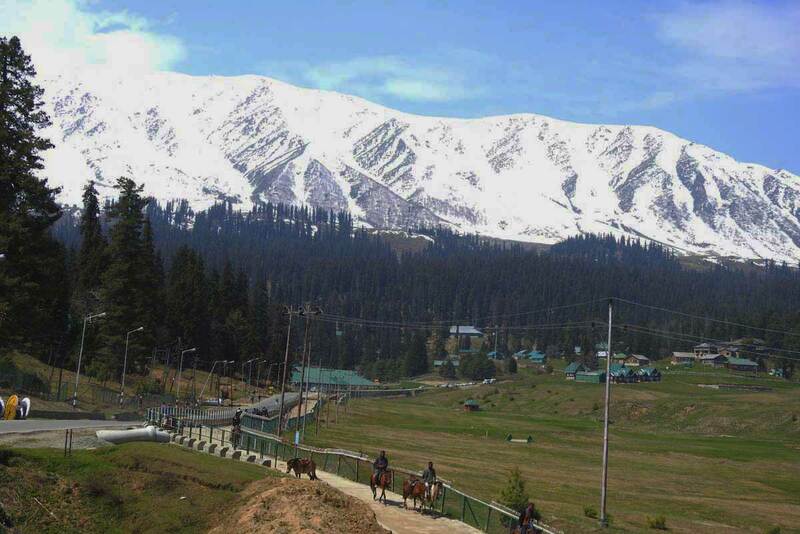 Gulmarg is just 51 km away from the capital city Srinagar and possible to enjoy even a day trip by road. WHY VISITING: A trip to Gulmarg in Jammu and Kashmir can be a memorable one for many reasons. There are many cool and top things to do in Gulmarg. A beautiful hill station Gulmarg is a must-visit unique destination for ski lovers. Though winter is the best time for playing with snow and snow skiing, Gulmarg has a lot to offer for adventurers even in other seasons. The world’s highest (10,500 ft–13,800 ft) cable car or Gondola ride is one of the top attractions for any season in Gulmarg. You’ll love the breathtaking views of the snowy mountains during this ride. Some other favorite activities in Gulmarg are trekking, camping, water skiing, snowboarding, heli-skiing, pony riding to the scenic the Kongdoori Valley. Furthermore, the world’s highest (2,650m) Green Golf Course, oldest St Mary’s Church, Maharani Shiv Temple, and Aplather Lake are some of the must-visit landmarks in Gulmarg. HOW TO GET THERE: Gulmarg is just 51 km away from the capital city Srinagar and possible to enjoy even a day trip by road. It is also comfortable and more relaxing to get any taxi directly from Sheikh ul-Alam International Airport, Srinagar to Gulmarg. There is also well-connected regular bus services from Srinagar, Pahalgam, and Sonmarg. You can travel by train as well from Jammu Railway Station to reach Gulmarg. The Udaipur lakes, so close to a major Indian city, and yet such an unexplored place. WHERE: When most people visit Udaipur in India, they visit the city palace and Lake Pichola, but don’t venture any further. If you want to see something else on offer, then explore the stunning surrounding lakes of Udaipur. WHY VISITING: North of Pichola lake is Fateh Sagar Lake, a great spot to pack a picnic and relax. There are hardly any tourists during the day, so you’ll have the spot to yourself. Then in the evenings, locals gather here to catch the sunset with a beer. Another fantastic lake of Udaipur is Lake Badi. This is my favourite as it’s tranquil, beautiful and has a fantastic sunset. Apart from the monkeys, there is no one here, which makes it even more amazing. You can also hike to a viewpoint above the lake to catch a stunning panoramic, but I preferred the on-ground view. When you drive around on a moped, you’ll actually discover lots of lakes that no typical tourist visits. Find your own lake, and simply relax with a good book or just listen to the sounds of the birds and animals that surround you. Pure bliss! HOW TO GET THERE: Udaipur is located in the Rajasthan state of India and it’s super easy to get to. You can fly from other major cities in India, such as New Delhi or Mumbai for cheap, or you can get a train there from all over the country thanks to the brilliant railway system India has. Once arrived, the best way to see these lakes is via moped rental. It’s super cheap and available in the city centre for a couple of dollars a day. Alternatively, if you’re not comfortable on a moped, you can rent a tuk-tuk for the day to take you to and from the lakes. WHERE: Chikmagalur is a small hill station located in the state of Karnataka. It is home to roughly 118,000 people and is famous for its’ coffee plantations. WHY VISITING: There are five main local coffees that are grown and brewed in Chikmagalur. The five famous types are Panduranga Coffee, Arabica Coffee, Vanilla Coffee, Blended Coffee and Mysore Coffee. You can get a tour of the plantations or try the coffee with your local homestay and or hotel. HOW TO GET THERE: The two main ways of reaching Chikmagalur is by air or road. Unfortunately, there is no train station in Chikmagalur so you are restricted to either flying or driving. If you prefer to fly you can fly from the main Indian cities such as Chennai, Mumbai, Kolkata or New Delhi into the Mangalore Airport. From Mangalore Airport you can hire a taxi to take you the rest of the way. I would recommend taking a bus or hiring a car to drive you from Bangalore, Mysore or other nearby larger cities. The region of Karnataka is breathtaking and when you travel by road you will be able to see the full beauty of the landscape.